By just about any measure of size, China is the world’s leader in fintech. It is far and away the biggest market for digital payments, accounting for nearly half of the global total. It is dominant in online lending, occupying three-quarters of the global market. A ranking of the world’s most innovative fintech firms gave Chinese companies four of the top five slots last year. The largest Chinese fintech company, Ant Financial, has been valued at about $60bn, on a par with UBS, Switzerland’s biggest bank... Its fintech giants have shown what can be done. For emerging markets, the lesson is that with the right technology, it is possible to leapfrog to new forms of banking. For developed markets, China offers a vision of the grand consolidation—apps that combine payments, lending and investment—that the future should hold... For about 425m Chinese, or 65% of all mobile users, phones act as wallets, the world’s highest penetration rate, according to China’s ministry of industry and information technology. Mobile payments hit 38trn yuan ($5.5trn) last year, up from next to nothing five years earlier—and more than 50 times the size of the American market. This carries the greatest relevance for India, where digital transactions market may be just about to explode. And it carries one advantage which even China cannot boast of, Aadhaar, the biometric identity which already covers more than a billion Indians. I can foresee the potential of five disruptions in the retail payments market from the initiatives already underway. 1. The RuPay payment gateway has, as I blogged earlier, the potential to break the oligopolistic stranglehold of Visa, MasterCard, and Amex on the payment gateways market. 2. The Unified Payment Interface (UPI) supports immediate transfer of money between different bank accounts. It addresses the challenge of inter-operability among different banks and merges several banking features, seamless fund routing and merchant payments into one interface. It also dispenses with smart card based validation and provides competition for payment wallet services like PayTm. Users can download the respective bank UPI app. 3. The BHIM app is a digital payments app based on UPI that is promoted by the National Payment Corporation of India (NPCI), and has the potential to disrupt the market for e-wallet services. It uses the Aadhaar number for transacting over the UPI, it also has the potential of becoming the go-to immediate payment interface, eliminating the need to have individual bank UPI apps. It overcomes the limitation of existing e-wallet providers who require transferring money into the wallet and closed loop nature of transactions (transfers only from one wallet account to another), and offers the same set of services by directly intermediating with your existing bank account. 4. The Aadhaar Enabled Payment System (AEPS) potentially dispenses with the the need for intermediaries like wallet service providers by using Aadhaar to achieve single-click two factor authentication. 5. The BharatQR Code is the world's only interoperable payment system across merchant outlets. It creates a single national standard for all QRCode based transactions. This interoperability means that it can potentially dispense with Point of Sales terminals. The BHIM app supports BharatQR code based transactions, thereby raising the possibility of all kinds of immediate payment transactions with Aadhaar validation, without any intermediary service providers between the bank and the user. In countries where trust in online payment mechanisms and private financial intermediaries is a major constraint, government intervention may be useful to catalyse the market. A rural user is far more likely to trust a government sponsored financial intermediation than a similar service offered by a private provider. The challenge for the government is to understand when and where to step back and let the market take-over. Until recently, Chinese savers faced two extreme options for managing their money: stash it in bank accounts, where interest rates were artificially low, but it was as safe as the Communist Party; or punt on the stockmarket, about as safe as playing baccarat in a casino in Macau. In the middle there was nothing... The biggest breakthrough was the launch of an online fund, Yu'e Bao, by Alibaba in 2013... promoted as a way for people to earn interest on the cash in their e-commerce accounts... Invested through a money-market fund... this meant that savers could get rates that were more than three percentage points higher than those banks offered. And risk was minimal, because their cash was still ultimately in the hands of banks. Yu’e Bao attracted 185m customers within 18 months, giving it 600bn yuan of assets under management... In 2014 Tencent launched Licaitong, an online fund platform linked to WeChat. Within a year, it had 100bn yuan under management... In the West people generally need deep pockets before they can afford to buy into products such as money-market funds. 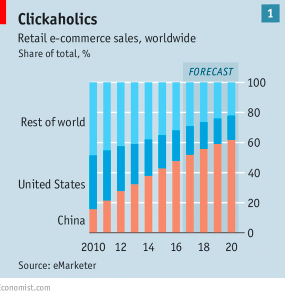 In China all it takes is a smartphone and an initial buy-in of as little as 1 yuan. WeChat, with 800m active accounts, and Ant, with 400m, can afford to be generous.